Day 4 – One judges a book by its cover from one´s own experience. 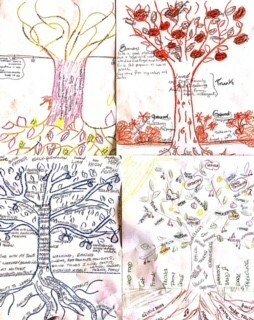 Today we started with the Tree of Life, starting with the roots, then the trunk, the branches, and participants are asked to put leaves on the branches, and adding on the fruits. Despite all our differences, there is a lot in common in our trees. The next session participants craft stories in small groups. The stories are then shared among all. The stories are entertaining, surprising, touching, funny…. It is clear: We are all creators and tellers of stories. Judging a book by its cover: participants based upon a picture wrote down their impression of these persons. It is clear that your previous experience influences the impressions and thoughts about these persons. The day ended with crafting a story as a whole group, in which each participant could only continue the story with one phrase. Funny, sometimes hilarious, but also reflective, as it helps to think about perception, impression and stereotypes.